Police investigating a suspected gun factory in Hailsham raided properties in Lancing, Shoreham and Eastbourne this morning and arrested four people. The National Crime Agency (NCA) carried out a series of raids this morning (Thursday, February 7) with Sussex Police as part of an investigation into an alleged gun factory found in Diplocks Way industrial estate, Hailsham, in August 2018. The raids were carried out on a number of properties in the Lancing, Eastbourne and Shoreham areas. The two men and two women arrested are currently being interviewed on suspicion of conspiring to manufacture, sell or transfer prohibited weapons or ammunition, said the NCA. 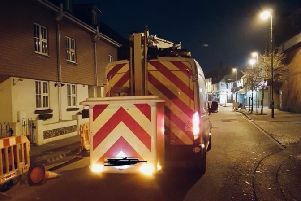 They were a 33-year-old man arrested at an address in Shoreham, a 44-year-old woman arrested at an address in Lancing, a 30-year-old man arrested at an address in Eastbourne, and a 24-year-old woman arrested at a separate address in Eastbourne, the NCA confirmed. At that time, officers found machinery and components believed to be used in the manufacture of firearms and ammunition as well as a number of handguns in various stages of production.